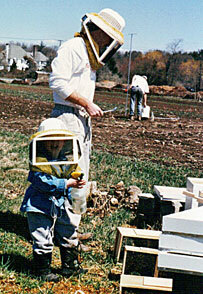 In 1995, I came across my first bee colonies. At the time, I owned a house painting business, and while doing a job at the home of a Rabbi in Newton, MA, I came across his two hives. The Rabbi's colonies were a concern to my painters, but an instant attraction for myself. By the spring of 1996, I had my first colony. That one colony lead to another, and in the way that many new beekeepers get hooked, I began to expand. My wife and our son were always being brought on board to help with the growing number of colonies. We all put in many hard dedicated hours, and after four years, our apiary became a full-time business. Early on, I chose the name of Boston Honey Company. The farm, conservation, and private lands I established my bees on are the founding areas of Massachusetts, rich with history. Our name invokes the Massachusetts and New England hub, city of Boston, as a symbol of our state, our past, our culture, and our significance. Just like Boston has a distinct appearance and nature from any other city, so does our local honey. The bees gather nectar and produce honey on revolutionary battle sites, original settlements, and the continually flourishing towns of the greater Boston area. Our honey is a product of my family and the region we live in. Today we remain committed to our bees and products. We continue to grow and find new ways to offer the benefits of our focus and care, and we hope that you will enjoy every step with us. I especially hope you come to find that like us, you too are grateful to the honeybee and for all that it gives.